A new tool developed by the University of Washington Department of Environmental & Occupational Health Sciences and its partners illustrates communities most impacted by pollution and environmental inequality. 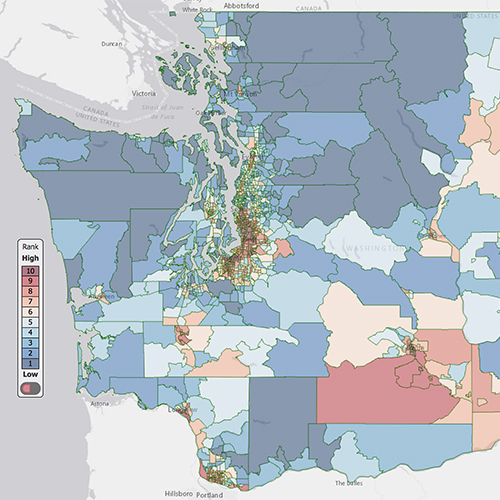 This tool harnesses available data to map 19 indicators of community health by combining measures of pollution, proximity to environmental hazards, population health and socioeconomic status into a score used to rank each of Washington’s 1,458 census tracts on their relative environmental health risk. The result is a statewide view of the cumulative environmental health risks each neighborhood faces that may contribute to inequitable health outcomes.